I experienced an uncanny craving for biscuits on Sunday – and it was incredibly easy to whip some up. In just an hour I managed to make four varieties, so our biscuit tins will be full for a few weeks! These have proved a big hit with my partner and I suspect they’ll become a lunchbox staple. I used wholemeal, but you can use plain or a mixture of both. If you like a springier biscuit – more like an American cookie – use self-raising flour or add a teaspoon of baking powder. 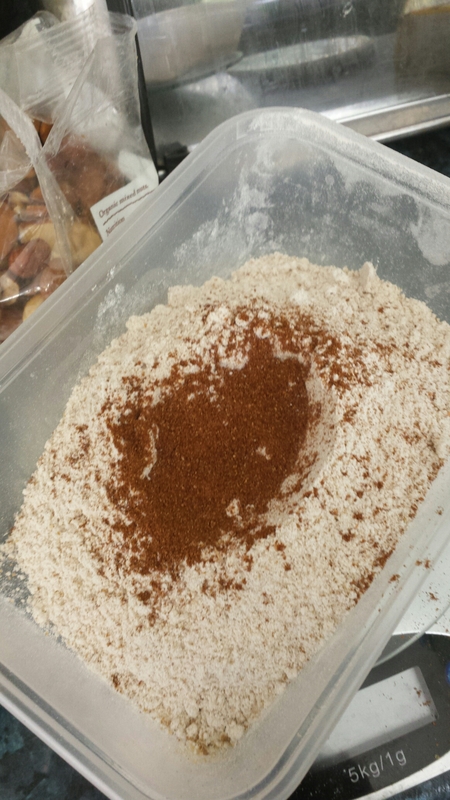 And for extra chew, use a mixture of Demerara and Muscovado sugars. You can also experiment with additions like dried fuit, coconut, chocolate – whatever you like! #1 – I mixed the wet ingredients as described in the BBC recipe, and then divided them in half to make two separate mixes. 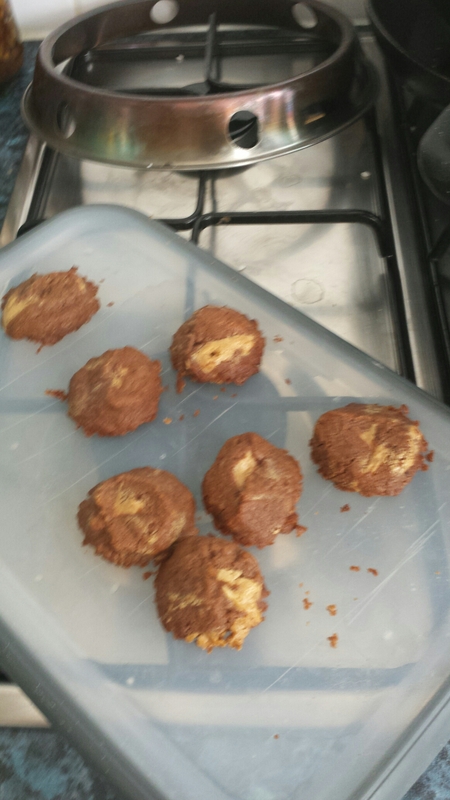 #2 For the spice biscuits I added 1 heaped teaspoon of mixed spice and 150g of whole wheat plain flour. 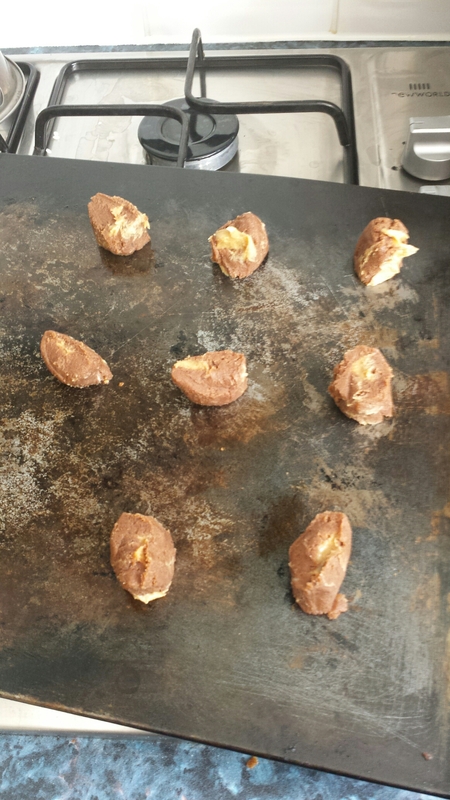 I chilled the dough for 15 minutes, then divided it into little balls and pressed them into flat biscuit shapes. In my oven, they took 8 minutes at 160C. 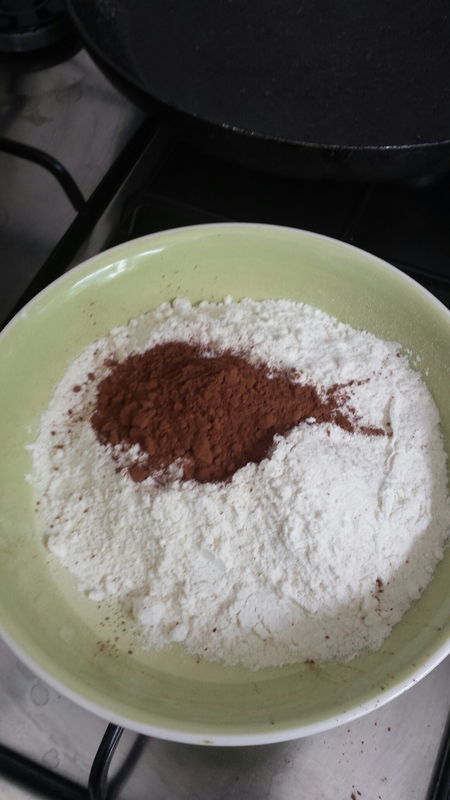 #3 For the plain chocolate biscuits, I added 150g plain white flour and 2 tsp cocoa powder. After chilling the dough, I divided it into small balls and pressed them down with my fingers before making indentations with a fork. These took about 8 mins to bake at 160C. #4 For the peanut butter chocolate biscuits I took half the chocolate dough and pressed it into a rectangular shape about 6in long. I then spread it with peanut butter and rolled it into a sausage shape before cutting it into 1in slices. 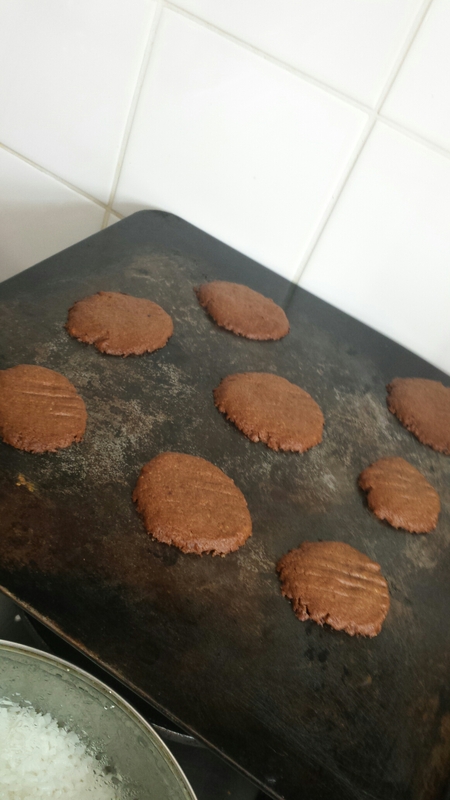 I baked them at 160C for 8-10 mins. 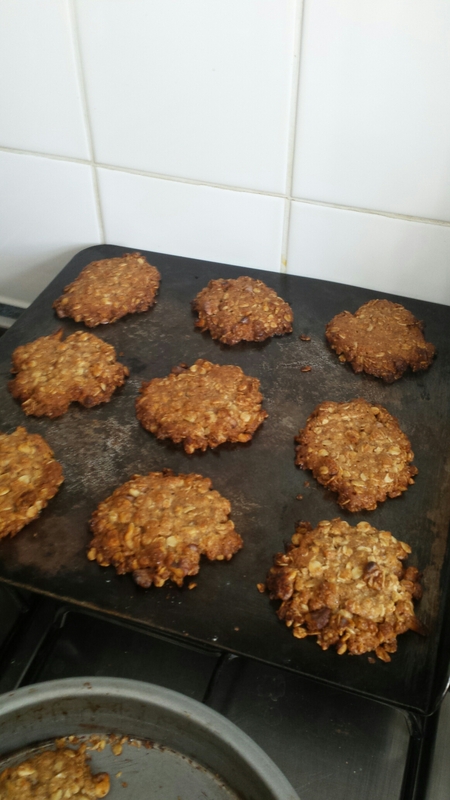 This entry was posted in Food and tagged baking, biscuits, chocolate, nuts, oats, peanut butter, plain chocolate biscuits, treats. Bookmark the permalink. I love these sorts of biscuits. Just as well I’m out of temptation’s range. Ah well, I won’t bring you any when I see you next week then! 😛 I rarely eat or bake biscuits, but yesterday I had a major craving for them and made LOADS. It will take us about a month to eat them if we each have one in our packed lunch every day, but they were so much fun to make. A month? Your self-discipline…these are the sort of thing I can knock off in an evening. Two if I try really hard. Ummm. If you wish to bring us one each next week, I’d love to try them!